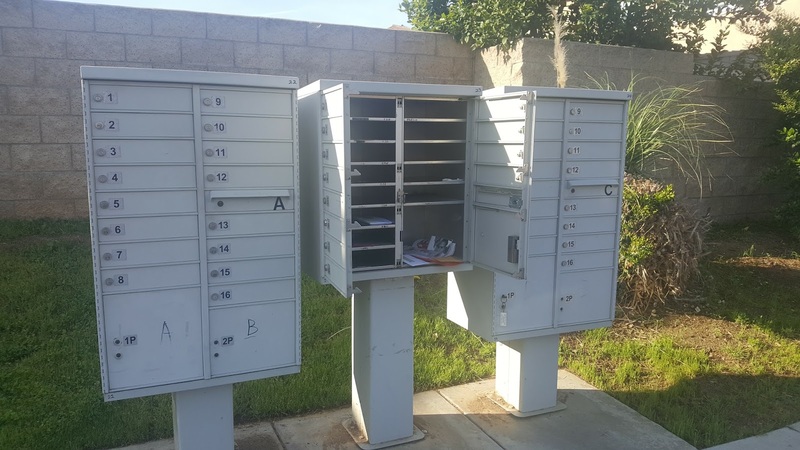 Temecula, CA - As many of us here in the suburbs of the Inland Empire have discovered, mail theft is a growing issue. Community 'cluster mail boxes' have been a prime target since they provide multiple opportunities to gain valuable personal info, checks and small packages. The picture here is from my mailbox across the street from my home. Needless to say I was rather pissed off to find this. 1 - Don't have mail or packages delivered to your home. Seriously, no joke. Get a post office box or a mailbox at a 'postal annex' type place. The advantage to a 'postal annex' type location over the Post Office is independent mail locations accept USPS mail AND UPS/FedEx - the Post Office will only accept USPS mail. You might need to drive to the mail box store to pick things up, but you will know that your Amazon package is safe there. 2 - If you are not into the idea above, or the cost for a separate mailbox is outside of your budget, be sure to pick up your mail from your mailbox EVERY SINGLE DAY. Not every other day, not once a week. EVERY DAY! If your mail isn't in the mailbox over night, then your mail doesn't get stolen by tweekers. It is really that simple. Tweekers and thieves typically work in the dark of the night, if your mail is already in your house - you have already made the best defensive move. 3 - If you have packages delivered to your home while not there, be sure to get a HD camera for the front door area. Make sure it works and is motion sensitive. Use it everyday. While some thieves will still take your package, if they see a camera, some will just move along after seeing others arrested when the videos of thieves go viral on social media. Share this post with friends and family! !